$2000 Presenting Sponsor for the festival by having your company logo on chamber website, enewsletter, Facebook, yard sign at event, banner hung at the Island throughout the weekend, outreach opportunity during the weekend and logo in the brochure mailing. $1000 Wagon Rides Sponsor supports horse drawn carriage rides for the weekend by having your company logo on a banner, on a yard sign, on chamber website, enewsletter, Facebook, and the brochure mailing. 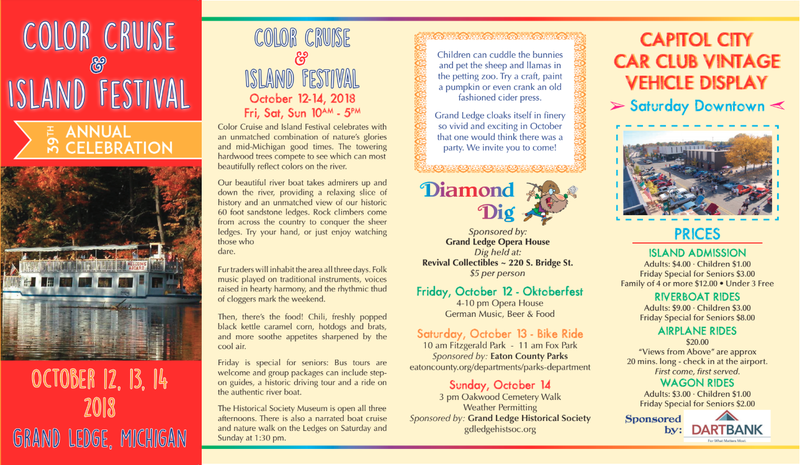 $500 Children's Activities Sponsor supports the transportation of local school children and the activities for them by having your company logo on chamber website, enewsletter, Facebook, banner hung on the island and yard sign all weekend if the festival and brochure mailing. $250 Island Sponsor of the festival supports the demonstrators and activities throughout the weekend by having your company logo on the chamber website, enewsletter and Facebook, banner and brochure mailing. $150 Your company logo will be listed in the brochure mailing. Tickets for admission and all rides are only available at the event! * Friday Special for Seniors is available for those 55 years old and older.